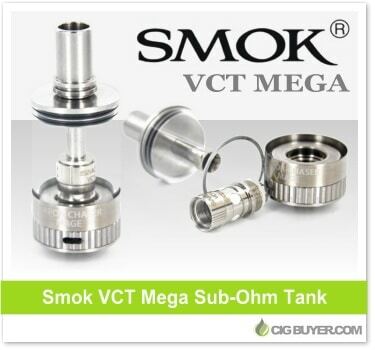 Known as the “Vapor Chaser Tank”, the Smok VCT Mega is the enlarged version of the standard Smok VCT Tank. It uses the same replaceable organic cotton heads (available in single, dual, DIY and Ni200 coils) and also incorporates an adjustable airflow and liquid feed system. In addition, the Smok VCT Mega offers not one, but two airflow intake holes in the bottom of the tank and has a huge 6ml capacity. * No special coupon code is required. Good while supplies last. A1-Core: Single vertical coil with special adjustable e-liquid flow design for use with all different PG/VG ratios. Available in 0.5Ω and 1.2Ω resistances. These coils also include a stainless steel mesh ring at the top to keep the cotton in place, and to reduce any possible spit back while inhaling. A1-S Core: Identical to the A1-core coil, but using stainless steel wire for corrosion resistance, and more surface area contacting wick for a warmer, denser vape. Available in 0.33 and 0.5Ω resistances. These coils also include a stainless steel mesh ring at the top to keep the cotton in place, and to reduce any possible spit back while inhaling. X1-Core: Single horizontal coil with airlaid paper for a more stable liquid feed. 0.5Ω and 1.2Ω resistances. X1-S Core: Identical to the X1-core coil, but using stainless steel wire for corrosion resistance, and more surface area contacting wick for a warmer, denser vape. Available in 0.33 and 0.5Ω resistances. X2-Core: Dual horizontal coils. Lower resistance and longer lifespan than the X1-core Rebuildable DIY core: RBA coil design with dual air channels and greater airflow. Ni200-Core: Pure nickel wire for use with temperature-controlled devices. Vertical coil design. Rebuildable DIY Core: RBA coil design with dual air channels and greater airflow.